The Atlas Copco LS 16 cut-off saw rental is available in Rochester NY, Ithaca NY and Upstate NY from the Duke Company. 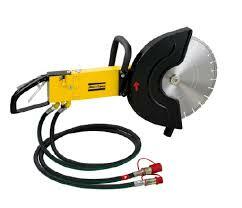 Make a quick job of cutting concrete, asphalt and steel. It’s simple. Atlas Copco hydraulic cut-off saws have a direct drive and simple machinery — meaning high productivity and reduced maintenance. Easily illustrated when compared with belt-driven saws. The compact, slim design and open cutting face give you a good overview of your work. With the help of a lightweight cart you can use the saws for floors, roads and other light surface jobs. The saws even work perfectly even under water.